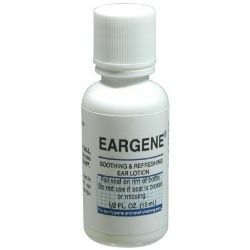 Soothing and refreshing ear lotion. Specially designed to relieve itching caused by earmoulds. Eargene, the one product that defines ear hygiene, is now sold by a majority of Hearing Aid Dispensers throughout the world. It is the only product whose primary purpose is to relieve itching ears. Eargene is a delicately balance formula of soothing, cleansing and healing ingredients prepared especially for the tender area occupied by the earmould. Additionally, Eargene also relieves chafing due to eyeglass, behind-the-ear and bone conduction receivers.